Have you ever had a tenant leave in the middle of the night – or the middle of an eviction? 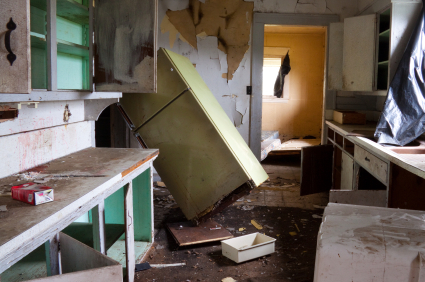 Did you ever wonder what to do when the tenant abandons the property? Basically, when a tenant abandons the property, you don’t need to file an eviction or wait for the sheriff. You can change the locks. As for the tenant’s stuff, in some states, you can simply toss it. Check your state or local law to see what your legal obligation is to store the items for the tenant. If you aren’t 100% certain that the tenant has abandoned the property, you should not change the locks. (a) For the purposes of this section, “abandonment” means the occupants have vacated the premises without notice to the landlord and do not intend to return, which intention may be evidenced by the removal by the occupants or their agent of substantially all of their possessions and personal effects from the premises and either (1) nonpayment of rent for more than two months or (2) an express statement by the occupants that they do not intend to occupy the premises after a specified date. If you do intend to claim abandonment, take pictures, gather evidence, and cover all bases to prepare for a possible wrongful lockout claim. Definitely, give the tenant notice in writing where you have stored their belongings (if you have anything) and give them adequate time to come get it. If you have ANY doubts, call your landlord-tenant attorney and do the proper legal eviction proceeding. In other words – pay the tenants to leave! If the tenant has NOT abandoned property (or you aren’t sure) or you messed up and they are coming back for their stuff, consider giving “Cash for Keys” to bribe the tenant to give up possession. While not deserving if they are behind on rent, it’s smart business because you avoid an eviction and possible damage to the property by the tenant. If you do this, however, make certain you get the tenant to sign a RELEASE OF LIABILITY FORM. This form, when signed by the tenant, will waive their rights to sue you for ANYTHING (even if you messed up and they have a claim). I loved having the audio portion. It allows me to multitask. But I still have the option of scanning the written portion if necessary. The audio is clear and informative. I like the approach of asking your audience / customers for their feedback before investing a bunch of time and money into something. For me it depends on the day. I think sometimes I’m in the mood for reading and some days I’d like to hear the audio. BUT, I have to tell you…the robotic mono-tone voice was a real struggle for me. It was hard to listen to. How often do you put a blog article out? It was only 3 min or so long. How about having someone from the staff read it? Or pay a VA? There’s got to be a cost effective way of creating an audio file that is easy on the ears! Great idea! It’s ok. Can live with or without it. I really like the audio, but also enjoy reading the message. The audio on my computer is very low…hard to hear. I have to use ear buds/bluetooth. I like audio if I have the time. Mostly I scan read and then come back to read the parts with the most interest. I think having both is a great option. Not everyone likes one or the other. This way you are satisfying the majority. It’s easier to use on the computer than on a phone, but I don’t mind reading it on either. It helps to have the audio when you read the text. The audio was clear, the speaker’s voice was pleasant. I liked the audio but I also like to be able to read the information to make sure that I didn’t miss anything and it is easier to take notes from written material. Thank you, everyone for taking the time to leave your feedback! I suspect it was a computer generated voice, as it was without inflection or emphasis, but it was clearly spoken. Having the speaker along with the printed word would be ideal. Great! AND the subject matter was good also. I really could have used that info 6 mos ago. Like the audio!